Serena Williams’ next opponent at the French Open will be 11th-seeded Julia Goerges. The German player reached the third round at Roland Garros for the fourth time with a 7-5, 7-6 (5) win over Alison Van Uytvanck in the final match on Thursday’s program. Serena Williams trailed by a set and a break at the French Open before recalibrating her shots, erasing that deficit and beating 17th-seeded Ashleigh Barty of Australia 3-6, 6-3, 6-4 to reach the third round. Williams had all sorts of trouble in the opening set, making 12 unforced errors and only three winners. But she began putting the ball right where she wanted early in the second set, accompanying nearly every point she won with a celebratory yell and fist pump. It took about 15 minutes for Williams to take four games in a row and control of that set. Williams broke to lead 2-1 in the third, held for 3-1, and was on her way at Court Philippe Chatrier. The 36-year-old American is playing in her first Grand Slam tournament in 16 months – and first since giving birth to a daughter about nine months ago. Williams has won three of her 23 Grand Slam singles titles at Roland Garros. Serena Williams has turned the match around and pushed Ashleigh Barty to a third set in the French Open’s second round. Williams won the second set 6-3 after dropping the first by the same score. Against the 17th-seeded Barty, Williams fell behind by a break at 1-0 in the second, but then took four consecutive games to get back into the match. Serena Williams has dropped the first set of her second-round match against 17th-seeded Ashleigh Barty of Australia by a 6-3 score. Barty also edged ahead in the second set by breaking Williams in the first game. The sleek black catsuit Serena Williams has been sporting at the French Open has won over another of her peers on the woman’s tour: Andrea Petkovic. The German said she loves it so much she might copy it. Williams said the suit made her feel like a superhero. She suggested that wearing it could inspire other women who, like her, had difficult recoveries from pregnancy. Petkovic said that because Williams is ”a very strong female figure, very inspirational,” she rubs some critics up the wrong way. ”They’re afraid of strong females,” Petkovic said. Caroline Wozniacki is another player who has spoken favorably about the suit. Rafael Nadal has completed another straight-set win to reach the third round of the French Open. Nadal is once again the big favorite in Paris following a tremendous clay-court season, and the 10-time champion lived up to the status by easily dispatching Guido Pella of Argentina 6-2, 6-1, 6-1 on Court Suzanne Lenglen. Nadal hasn’t lost a set at the French Open since 2015, when he was beaten in the quarterfinals by Novak Djokovic. In 2016, he withdrew with an injured left wrist after a pair of easy victories, then claimed every set he played last year en route to the trophy. Despite playing on consecutive days, top-seeded Simona Halep showed no signs of fatigue in beating wild-card entry Taylor Townsend 6-3, 6-1 to reach the third round of the French Open. The Romanian broke the 72nd-ranked American in the first game and jumped to a 5-1 lead. Townsend dug deep in the eighth game, with Halep serving for the set, clawing back a break to slow the progress of last year’s runner-up. Halep served out the last game to love, breaking into a smile after a winning volley at the net that brought up three match points. Halep said in her post-match interview that she struggled initially against the left-hander’s shots with topspin. But the score didn’t show it. The new court 18 introduced at Roland Garros this year is getting praised by players at the French Open. The court, which is partly sunken into the ground, can hold as many as 2,200 spectators, making it the stadium’s fourth largest. Dominic Thiem has also taste the venue, and he was not disappointed. ”Always full because there are always great matches there,” the seventh-seeded Thiem said after reaching the third round with a 6-2, 2-6, 6-4, 6-4 win over Stefanos Tsitsipas. ”People really want to be there. I prefer to play on a full center court with, I don’t know, 2,000, 2,500 people like court 18 than in front of 7,000 on Chatrier, because it feels kind of empty, and the atmosphere was amazing on court 18, so I prefer to play there,” Thiem said. Two-time champion Maria Sharapova improved to 13-0 in second-round matches at the French Open by beating 50th-ranked Donna Vekic of Croatia 7-5, 6-4. It took Sharapova a little bit to close things out. She led 5-2 in the second set, then served for the win at 5-3, but was broken when she sailed an off-balance forehand wide. Next for Sharapova is a matchup against sixth-seeded Karolina Pliskova, the runner-up at the 2016 U.S. Open and a semifinalist in Paris a year ago. Pliskova’s twin sister lost to Serena Williams in the first round this week. Richard Gasquet advanced to the third round of the French Open for the eighth straight year by defeating Malek Jaziri 6-2, 3-6, 6-3, 6-0. The 27th-seeded Gasquet was joined in the third round by fellow Frenchman Lucas Pouille, who advanced past Cameron Norrie 6-2, 6-4, 5-7, 7-6 (3) over two days after their match was stopped by darkness on Wednesday. It has been 35 years since a player from the host nation lifted the men’s trophy in Paris. Garbine Muguruza is in a hurry on and off court at the French Open. Both of her wins have been in straight sets. And she visited the vast Louvre Museum in only an hour. No wonder the Mona Lisa, the Louvre’s most famous resident, looked bemused. Canadian teen Denis Shapovalov’s French Open debut is over after a mistake-filled loss to Maximilian Marterer in the second round. The 70th-ranked Marterer, also appearing in his first main draw at Roland Garros, beat the 24th-seeded Shapovalov 5-7, 7-6 (4), 7-5, 6-4. Shapovalov had more double-faults, 11, than aces, six, and far more unforced errors overall, 82, than winners, 52. Shapovalov, who is 19, had never been seeded at a Grand Slam tournament before. Third-seeded Marin Cilic overcame a concentration lapse to advance to the third round of the French Open with a 6-2, 6-2, 6-7 (3), 7-5 victory over Polish qualifier Hubert Hurkacz. The Croatian, who won the U.S. Open in 2014, was cruising until the third set, when Hurkacz broke him for the only time in the match. Cilic, a quarterfinalist last year at Roland Garros, will next play 46th-ranked Steve Johnson of the United States. 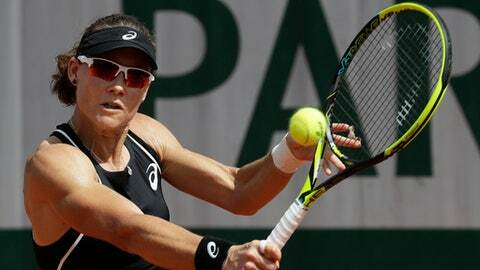 Samantha Stosur, a Roland Garros finalist in 2010, eliminated 30th-seeded Anastasia Pavlyuchenkova 6-2, 7-6 (1) in the second round of the French Open. Stosur was also a semifinalist in 2009, 2012 and 2016. Only once, in 11 attempts, has Pavlyuchenkova reached the second week at Roland Garros, making the quarterfinals in 2011. Stosur will next face Garbine Muguruza, the 2016 champion. Garbine Muguruza is through to the third round of the French Open with a 6-4, 6-3 victory over French wild-card entry Fiona Ferro. As she did in her first-round match against Svetlana Kuznetsova, the 2016 champion again impressed with her ease of movement around the court. Muguruza and Ferro exchanged breaks of serve at the start of the second set. But the third-seeded Spaniard broke her 257th-ranked opponent again in the seventh game to take the lead and closed out the win with her first match point on Ferro’s serve two games later. Play is underway at Roland Garros, with top-ranked Rafael Nadal and three-time champion Serena Williams both scheduled to compete in the second round at the French Open. Garbine Muguruza, the 2016 women’s champion, is already on court, playing French wild-card entry Fiona Ferro for a spot in the third round. Nadal, chasing a record-extending 11th men’s title, will play Guido Pella in the second round. After a straight-set win in her first Grand Slam match following maternity leave, Williams will face a tougher test against 17th-seeded Ash Barty. Two-time champion Maria Sharapova is also in action later against Donna Vekic. The skies are sunny, with no sign of possible storms forecast for the afternoon.